The settlement of Boksity (Бокси́ты) was established in 1929 to house the workers of the local bauxite mine. 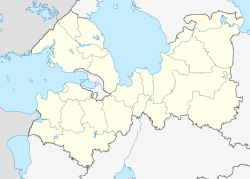 It was a part of Tikhvinsky District of Leningrad Oblast. In December of the 1934, the construction of a bauxite plant started. In 1935, the settlement was granted urban-type settlement status and given its present name. In 1940, the population neared 10,000 and a school, kindergarten, nursery, ambulatory and drugstore, several canteens, and shops were built. In 1950, Boksitogorsk was granted town status and on July 25, 1952 it became the administrative center of Boksitogorsky District. Within the framework of administrative divisions, Boksitogorsk serves as the administrative center of Boksitogorsky District. As an administrative division, it is, together with ten rural localities, incorporated within Boksitogorsky District as Boksitogorskoye Settlement Municipal Formation. As a municipal division, Boksitogorskoye Settlement Municipal Formation is incorporated within Boksitogorsky Municipal District as Boksitogorskoye Urban Settlement. Population: 16,585 (2010 Census); 18,128 (2002 Census); 21,839 (1989 Census). The town population reached its peak in 1979, at 23,200 people. Like much of Russia, the population of Boksitogorsk has gradually decreased since the 1980s. The ethnic composition of the town's population is primarily Russians. Several manufacturing enterprises are located in Boksitogorsk, including the aluminum metallurgy plant, which is one of the daughter companies of Rusal, as well as producers of reinforced concrete, alcohol, food, and milk. Companies extracting peat and producing plastic ware also operate out of Boksitogorsk. Autoroute H-3 Dymi–Boksitogorsk–Bochevo runs across the town. Autoroute A-114 Issad–Pikalyovo–Vologda runs 11 kilometers (6.8 mi) to the north of Boksitogorsk. A local line connects Bolshoy Dvor railway station on the St. Petersburg–Vologda railway line with Boksitogorsk. However, currently there is no passenger service. Public transport includes several town, suburb, and inter-town bus routes operated by local transport companies. Boksitogorsk contains one cultural heritage monument classified as cultural and historical heritage of local significance. This is the cinema building. ^ a b c d e Энциклопедия Города России. Moscow: Большая Российская Энциклопедия. 2003. p. 50. ISBN 5-7107-7399-9. ^ Телефонные коды Ленинградской области (in Russian). Телефонные коды России. Retrieved February 26, 2014. ^ a b c d О поселении (in Russian). Администрация Бокситогорского городского поселения. Archived from the original on September 7, 2013. Retrieved February 26, 2014. ^ История района (in Russian). Бокситогорский муниципальный район. Archived from the original on September 28, 2013. Retrieved February 26, 2014. ^ Общая информация о Бокситогорском муниципальном районе (in Russian). Администрация Бокситогорского муниципального района. Archived from the original on February 23, 2014. Retrieved February 26, 2014. Законодательное собрание Ленинградской области. Областной закон №78-оз от 26 октября 2004 г. «Об установлении границ и наделении соответствующим статусом муниципального образования Бокситогорский муниципальный район и муниципальных образований в его составе», в ред. Областного закона №22-оз от 8 мая 2014 г. «Об объединении муниципальных образований Анисимовское сельское поселение Бокситогорского муниципального района Ленинградской области и Самойловское сельское поселение Бокситогорского муниципального района Ленинградской области и о внесении изменений в отдельные Областные законы». Вступил в силу через 10 дней со дня официального опубликования (29 ноября 2004 г.). Опубликован: "Вестник Правительства Ленинградской области", №34, 19 ноября 2004 г. (Legislative Assembly of Leningrad Oblast. Oblast Law #78-oz of October 26, 2004 On Establishing the Borders of and Granting an Appropriate Status to the Municipal Formation of Boksitogorsky Municipal District and to the Municipal Formations It Comprises, as amended by the Oblast Law #22-oz of May 8, 2014 On the Merger of the Municipal Formations of Anisimovskoye Rural Settement in Boksitogorsky Municipal District of Leningrad Oblast and Samoylovskoye Rural Settlement in Boksitogorsky Municipal District of Leningrad Oblast and on Amending Various Oblast Laws. Effective as of after 10 days from the day of the official publication (November 29, 2004).). This page was last edited on 26 August 2017, at 21:10 (UTC).